Diana Wynne Jones is one of my favorite authors. You’ve been warned. Ingary is a land where eldest daughters have boring lives, so Sophie doesn’t aspire to much. When she’s run ragged working in the hat-shop her family owns, she does her work gladly. And as her hats are sold with great success, bringing in more and more business, rumors of a wizard, Howl, who eats the hearts of beautiful women begin to circulate. And then his castle arrives, floating in the misty hills above the town. Sophie, caught in an unfortunate circle of jilted lovers, obscured identity and petty magic-users, must leave the cosy hat-shop she has made famous after being cursed, and stumbles right into Howl’s lap. Thankfully, she’s old and unappealing. If I told you Howl’s Moving Castle was a love story, it would be partly true, but I’d be dismissing the part where Sophie learns who she is, helps Howl become something else, and saves several (hundred?) people from misery. 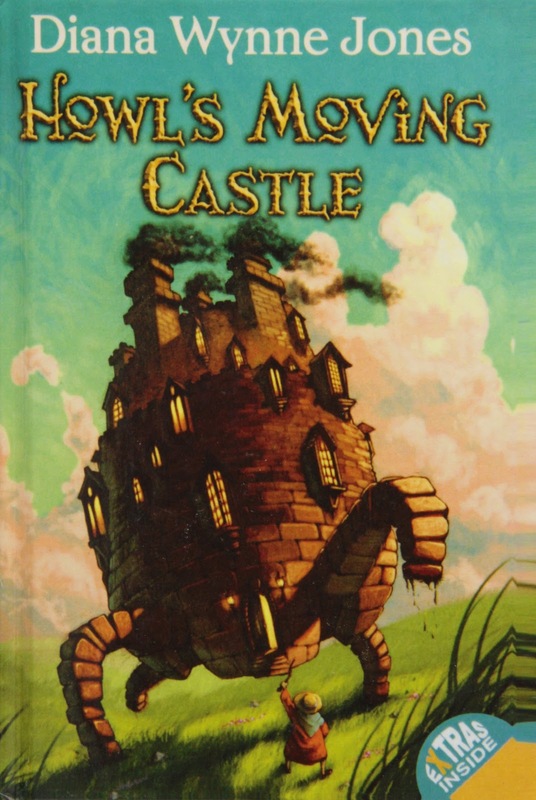 Diana Wynne Jones writes funny, sometimes whimsical prose that clearly enjoys being read. But she can also write dark and twisting passages that are harrowing and chill your hands while you are up all night trying to see who will prevail. This book is no exception. Oddly, the last time I reread this book, I remembered it less fondly. I was very critical of something (specific what I will not share) and this time I could not relocate it. I will say that I was feeling a little ornery when I read the ending and so I did not think it as lovely as last time. And yet the whole book was more fond to me this time. I think I identify a little too much with Howl. He's a twenty-something who likes to be liked and runs away from responsibility. Perfect. Watching the movie soon afterward really shows me that the book is far better, the movie loses and combines some aspects and thus dilutes some of the charm, in fact changing the message entirely and it worries me that people think that the book is exactly the same. If you’re looking for a brief opinion on whether to read the book first, or if you should read the book now that you’ve found out there is one, yes, unequivocally, you should read this.